The Crimson Trail hike had 17 hikers: Jim, Anne, Dave P, Reinhard, Dan Z, Crystal & her friend, Norma & her daughter, Gloria, Gordon, Brian D, Gail, Tiffany & her two dogs, Jennifer, Chris and one other person. The adventure portion of the hike was crossing Spring Hollow creek with the bridge out. Crossing the creek was a bit nerve-racking, but once across watching everyone else was quite entertaining. Many people took off their shoes and socks and walked through the knee high water. Jennifer wore shoes in the shape of a foot and was the only one to cross the creek without much effort. We broke up into two groups, a fast group and a slow one. Jim stayed with the slow one along with Anne, Reinhard, Gloria, Brian D, Tiffany & her two dogs, Jennifer and Chris (see the photo, below). The two groups stayed in contact via walkie talkie. 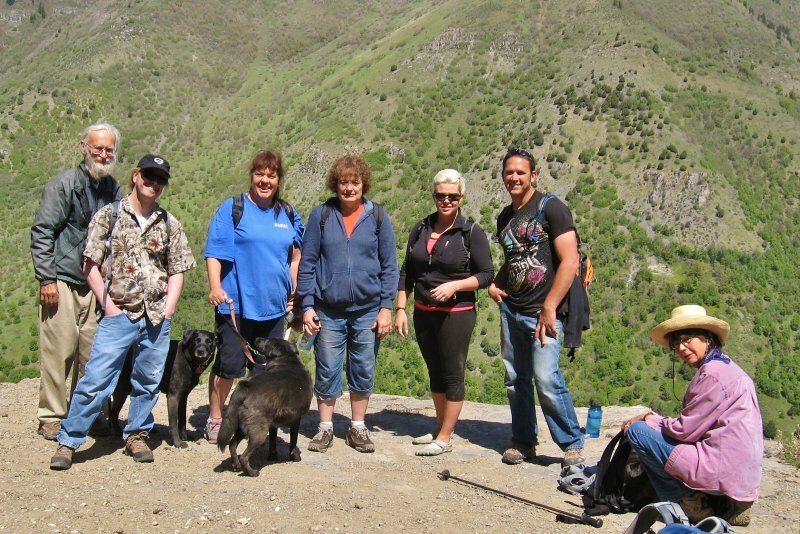 The weather and scenery were great and everybody in both groups enjoyed the hike. The fast group got back to town about 11:45 AM and the slow group around 2:15 PM. The entire hike, from Spring Hollow, up the Crimson Trail and back by way of the Riverside Trail covered about 4 1/2 miles with about 1000 feet of elevation. [Trip report and photo thanks to Jim, the hike leader].